Now.. toys! I acquired a new surf kayak recently. It’s a very different beast, with different characteristics to my XS so despite having told myself that I should now sell my XS I have decided to keep both. After all folk who play golf have more than one club and each boat will excel under different conditions. Which reminds me, if, in my old age (or sooner), you ever see me reduced to playing golf please shoot me.. Oh, I also recently saw a golfer describe himself as an ‘athlete’.. now really, in a game that encourages dubious fashion choices and the use of electric buggies? 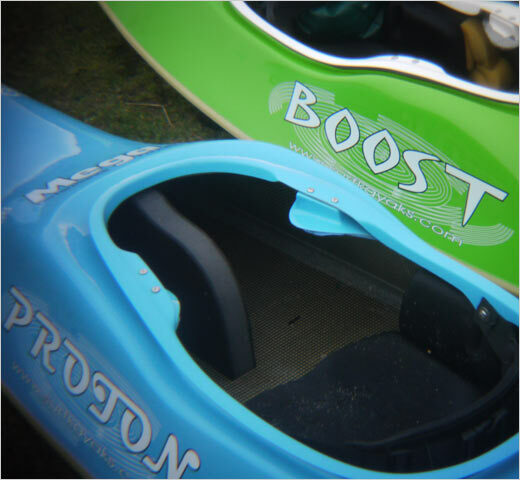 Anyway, I digress.. back to surf kayaks… my new Boost. I’ve only taken it out twice thanks to my back but I can claim to be very happy with it. First time out was an ideal day for getting to know a new boat without risk of re-injury – a super clean, super mellow wave of about 4ft. Not super-exciting but a very fun, very ‘harmonious’ session with friends. The second session, just a day later was very different. Fantastic, clean surf with overhead barrels, around 7 or 8ft I suppose on the face with bigger sets on occasion. It should have been a wicked session but with the awareness of a dull ache in my lower back I was so scared of getting caught inside by a big set and crippling myself that I spent the whole session way out back waiting for just the very biggest waves. As a result I got cold.. it was a raw day of about 4 degs C.. and took only 5 or 6 waves.. I won’t surf again until I’m confident I’m not going to trash my back. Biggest impression of the new boat is the speed it can carry. I surprised myself by making sections that I would never have got away with in the XS. 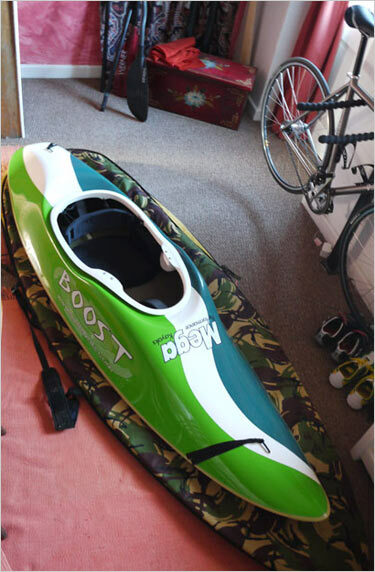 Naturally it is fitted with a brand new set of my carbon fins and as such totally rocks :-) As with any new boat however it is going to take a few months to really get used to it and fine tune the set-up. my Boost with it's bigger brother the Proton. The Proton belongs to a friend. It has flowers on it. One of these days I will take my camera out in the waves with me.. I suspect it is in fact my camera that is responsible for my injury in the first place. Normally in the surf I wear an impact vest, kind of like soft, tight fitting body armour.. it gives quite a lot of support and protection to my lower back. The day I hurt myself I wasn’t wearing it.. I’d wanted to take my camera out so I was wearing just a regular white-water style PFD with a pocket at the front for my camera. It offers no protection at all. Hmmm. Speaking of the XS – it has a composite seat fitted, as opposed to a foam seat. Works really well but they can eventually wear through the hull as the boat flexes.. the same thing can happen on sea kayaks. A reminder this week that kayaks need regular inspections, much like a car, rather than just slinging in the garage ’till next time. I pulled the seat out to replace some of the fittings that were corroded to find the seat edges were wearing into the carbon/kevlar hull laminate. Not ideal. The weather is too cold and damp for laminating in the workshop at the moment so I had no choice but to bring the boat into the house to do the repairs. Not a hardship. p.s standing by for lots of pro-golf mail..
Mike you are right: seats that swing (even just a tiny bit) wear the laminate of kayaks hulls where a bit of grit or sand acts as grinding material. I fix my kayak seat with a healthy dose of goop (polyurethane caulk) or anchoring the seat to the floor (a stud fibreglasses to the hull and bolting the seat). If I need to remove the seat I use a thin kitchen knife and cut the goop away between seat and hull. 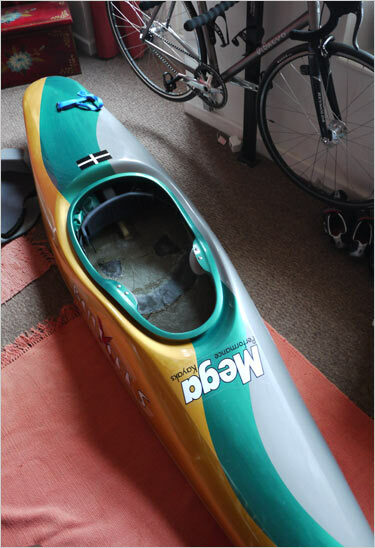 I no longer have to remove seats and regularly rebuild a section of the kayak where the seat has rubbed a few layers away. a good idea, thanks, I shall do the same in the surf boat I should probably do my tiderace while I’m at it…!